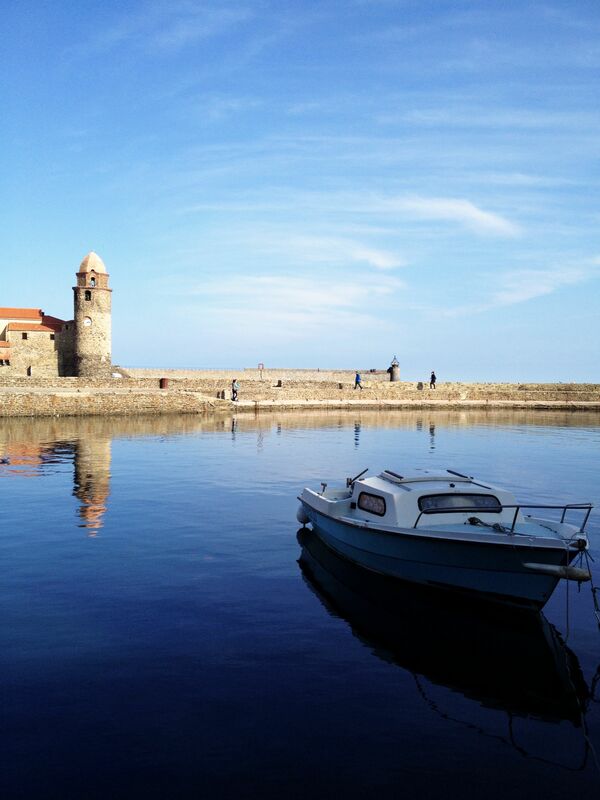 Last Saturday, my parents and I went to Collioure, a little town in the south of France. 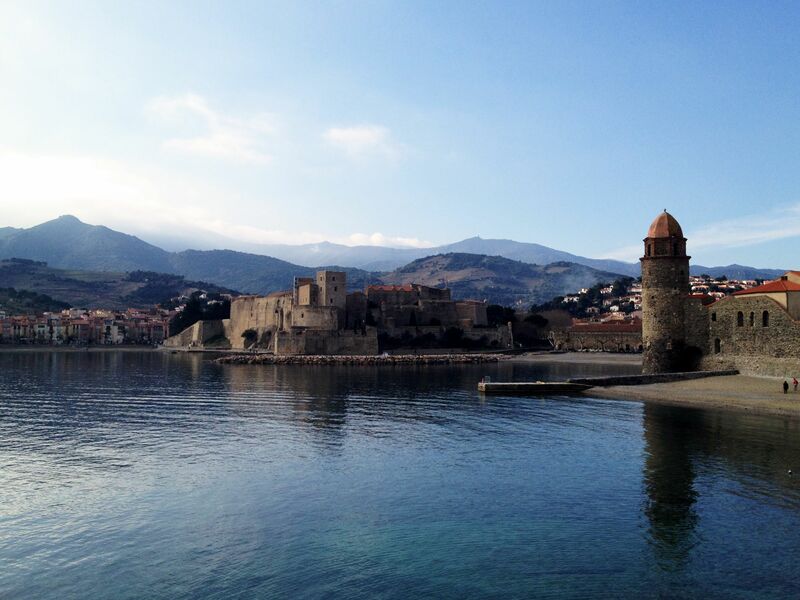 I had previously visited Collioure on a school trip a few years ago and I liked it a lot, so I decided that my parents and I could go on a day trip there. 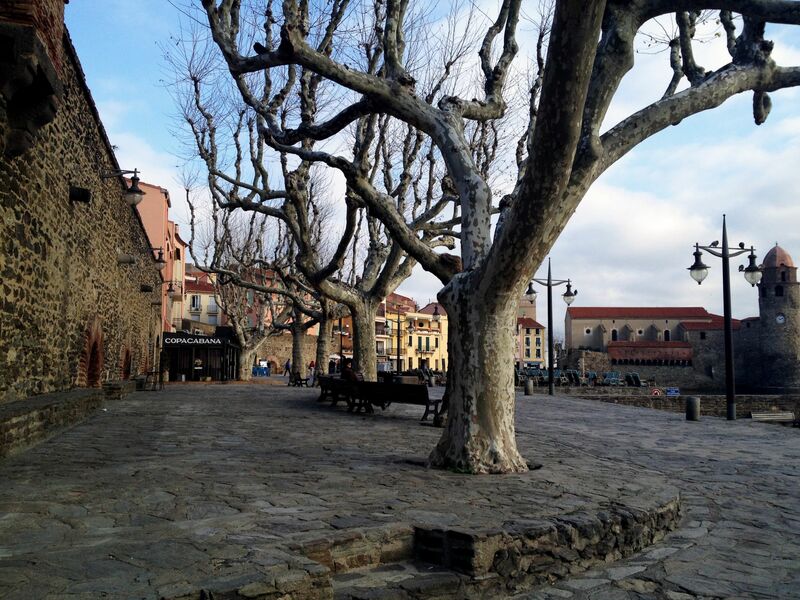 It is only two hours away by car from where I live, because that village is very close to the border between Catalonia and France. I warn you that this is going to be a post with a lot of photos! Before arriving to our destination, we got a little bit lost but fortunately our mobiles helped us! Once we arrived we decided to have a coffee, as it was quite early and we wanted to rest for a little while after the car journey. 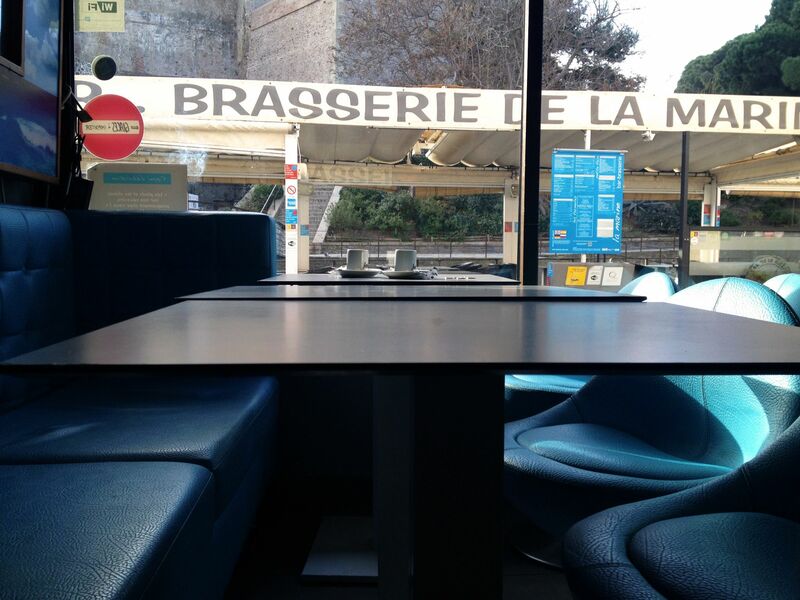 We went to a small café near the beach. We did not like it too much to be honest. The coffee was not really good and it was quite expensive (3.30€ each). 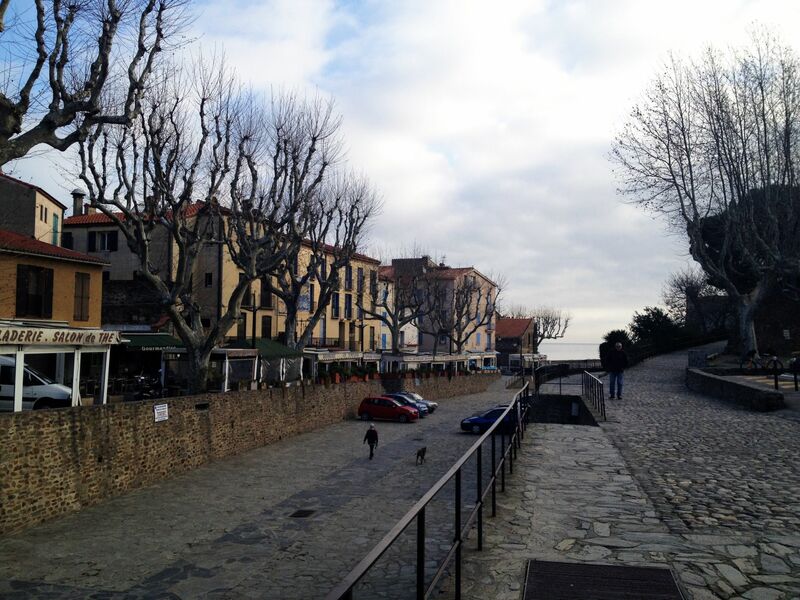 After that, we walked a little bit around the café, but then we went straight to the beach. The sky was bright blue and we were having a great day. 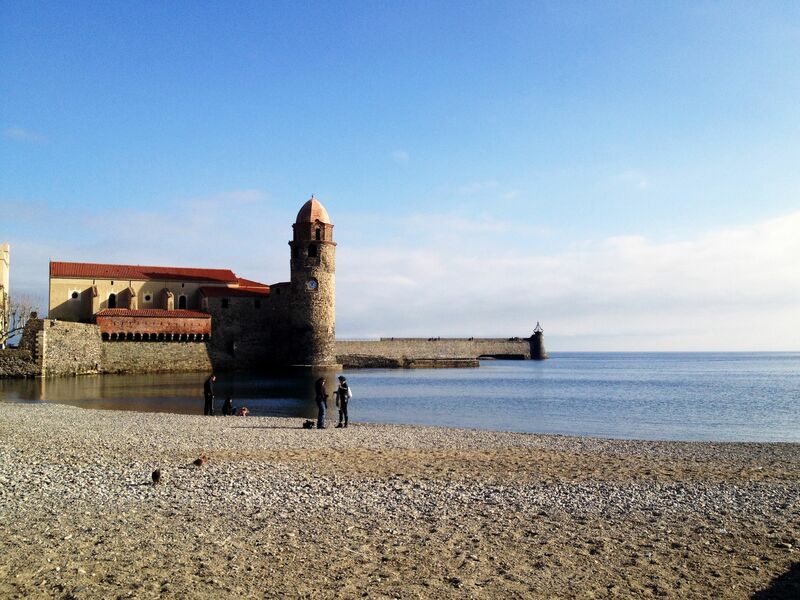 The beach is the best thing that Collioure has. It is really beautiful. 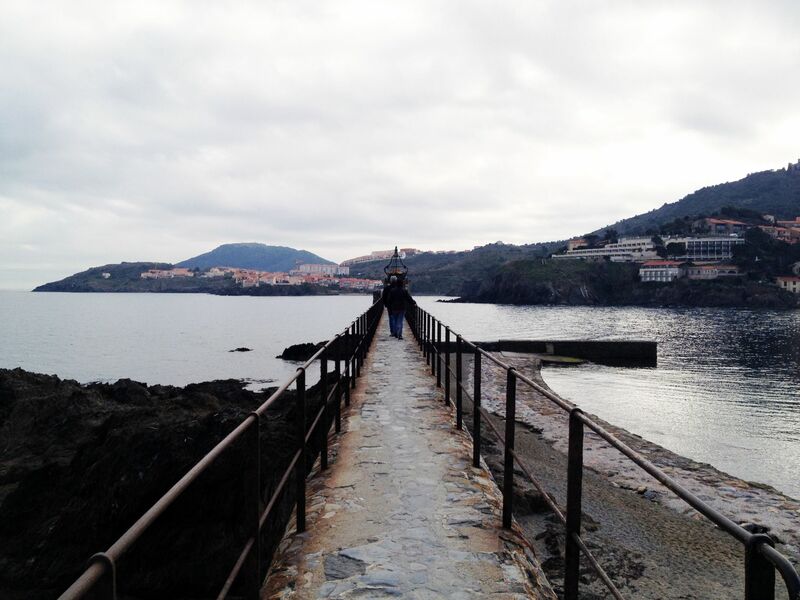 We really enjoyed wandering around and looking at the endless sea. 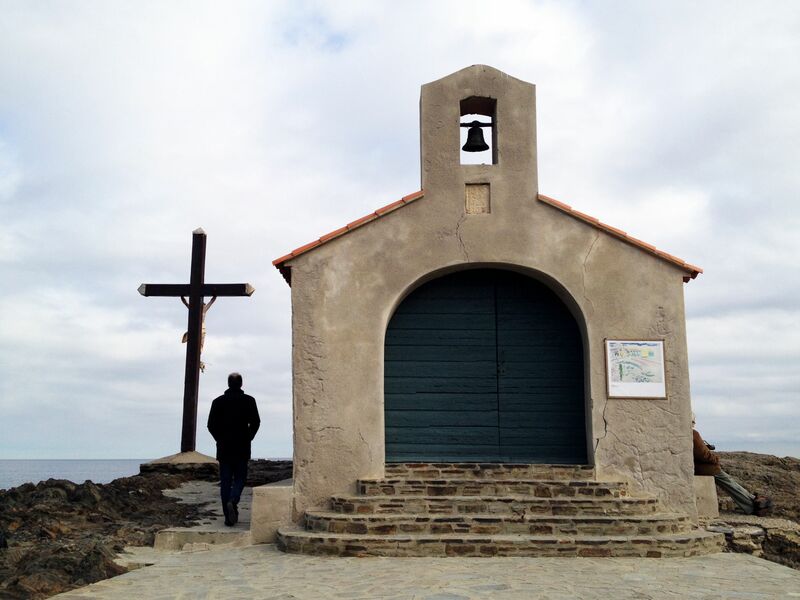 From the beach, you can see l’Eglise de Notre Dame des Anges, which is lovely, especially because it is just in front of the sea. Then we walked along the dock. 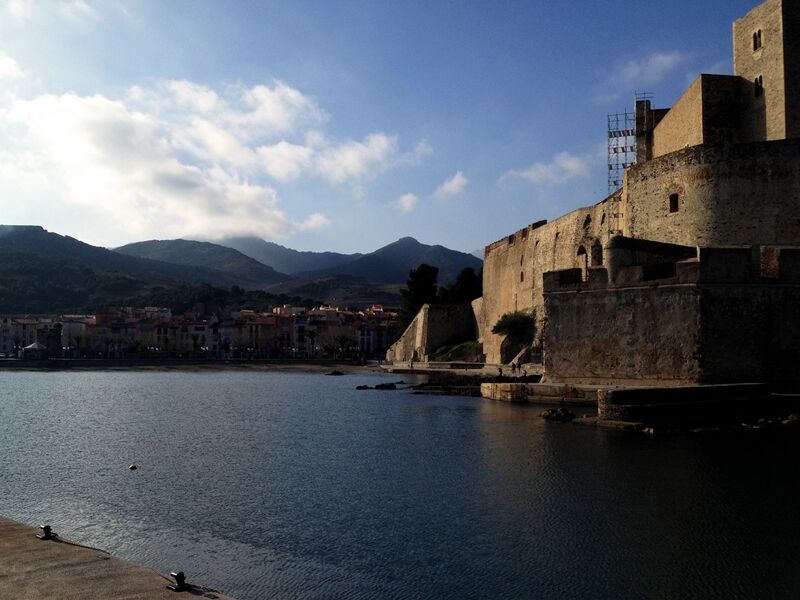 From there, you could see the Château Royal, which is also very close to the sea. On the dock, there is a frame so you can take a photo of the clock tower. 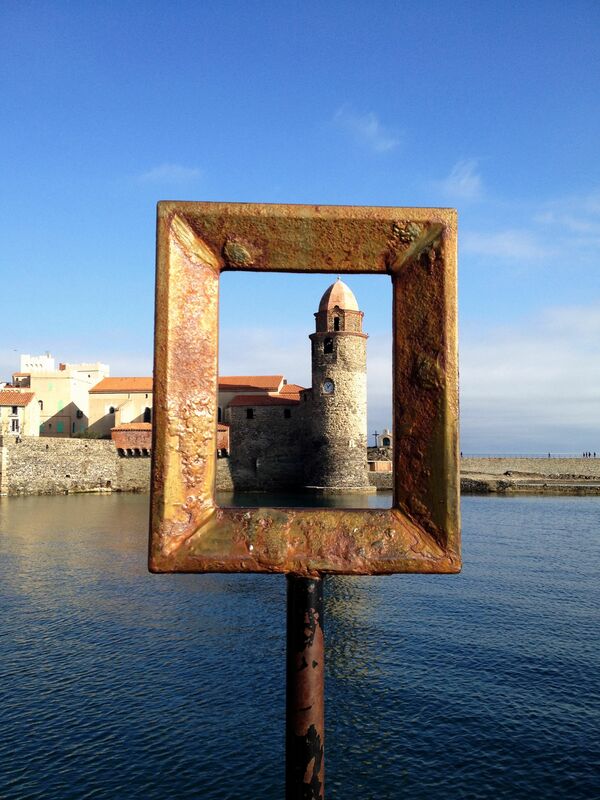 There are plenty of these frames around the beach. 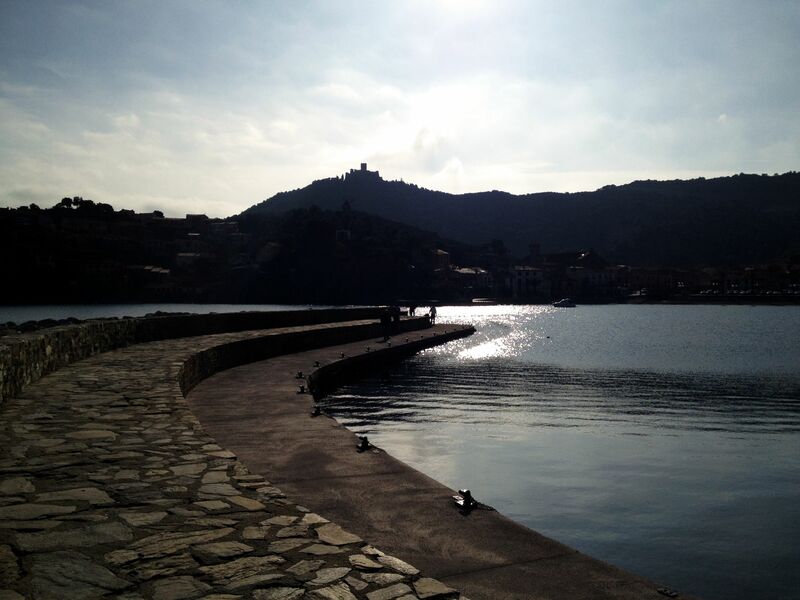 It is something very attractive for tourists! After this walk, the weather changed. Now it was cloudy, and we thought it was going to rain. Despite that, we went to visit Saint Vincent chapel. It is very small but it is beautifully located. It is just in the middle of the sea, at the top of some rocks. 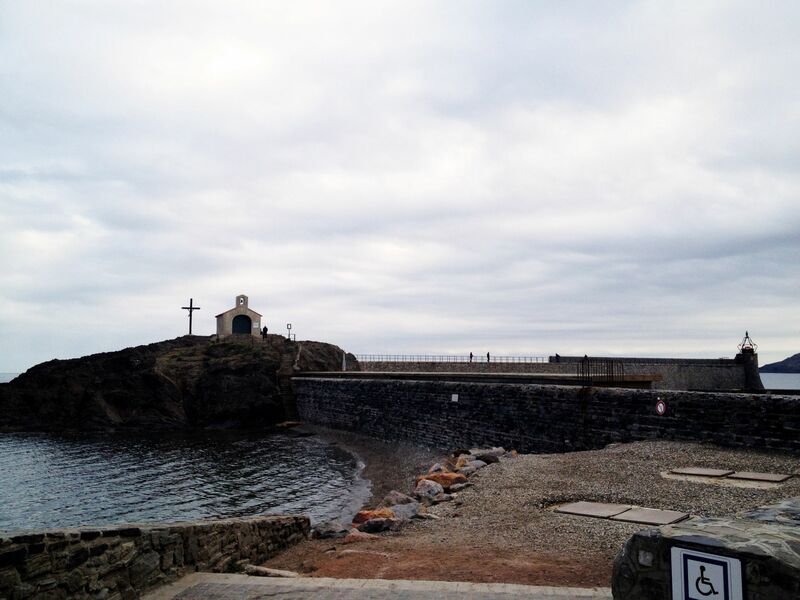 There is also a big cross with Jesus Christ on it looking at the sea. There is also a breakwater there. From there, you can see the entire town, which is something I really liked. 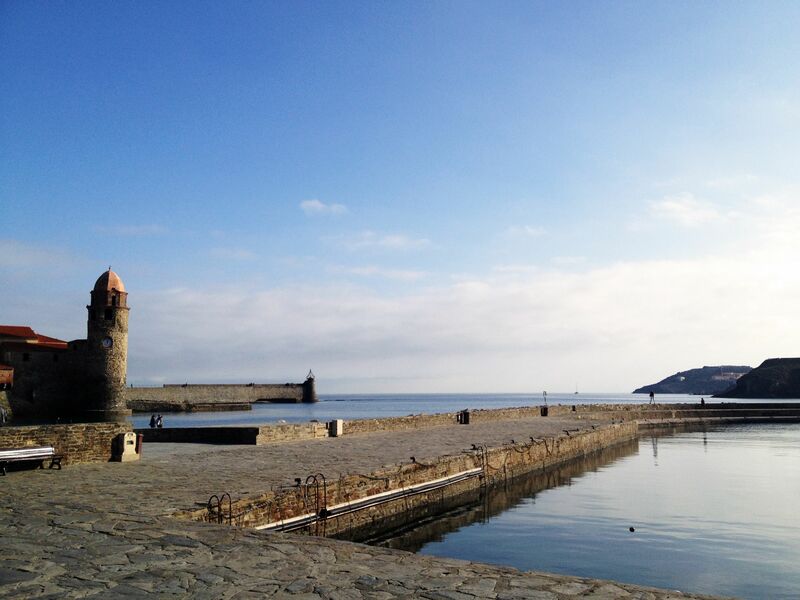 If you look at the other side you only see the sky and the sea, which is lovely too. Fortunately, it did not rain and the sky became bright blue again. We were a bit tired now and also hungry, so we decided to have lunch. As we were enjoying the views a lot, we did not want to eat at a restaurant. In fact, most of them were closed until February, so we bought some sandwiches and some drinks and had a little picnic in a bench. 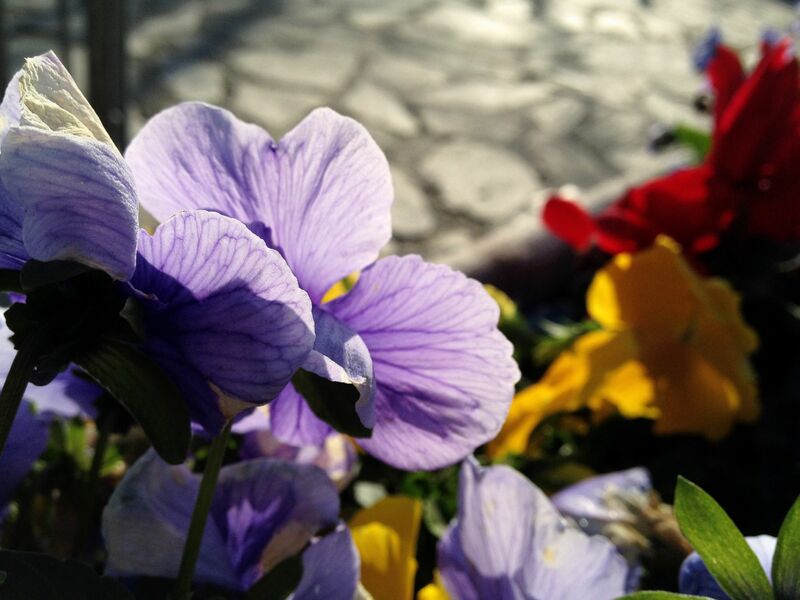 It was really nice to be surrounded by the colours of the flowers. 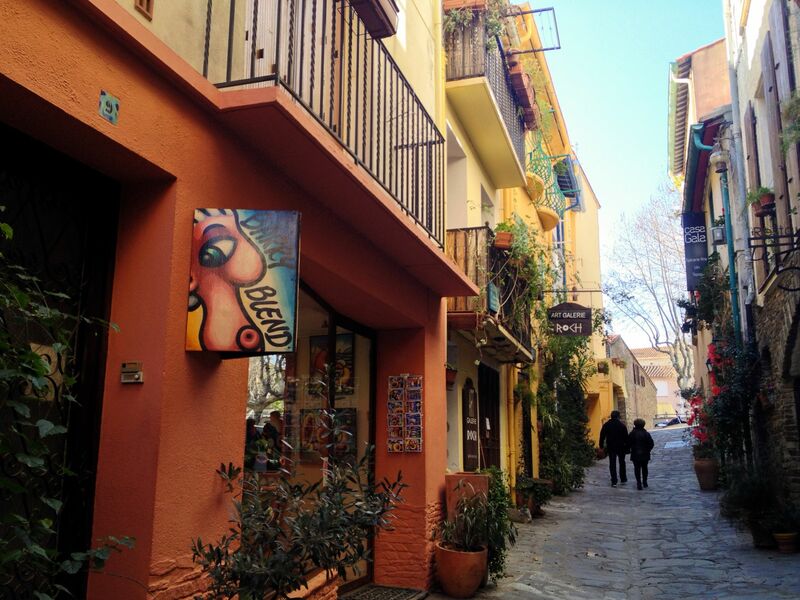 After having lunch, we wanted to walk a bit more, but this time we wanted to wander around the streets. 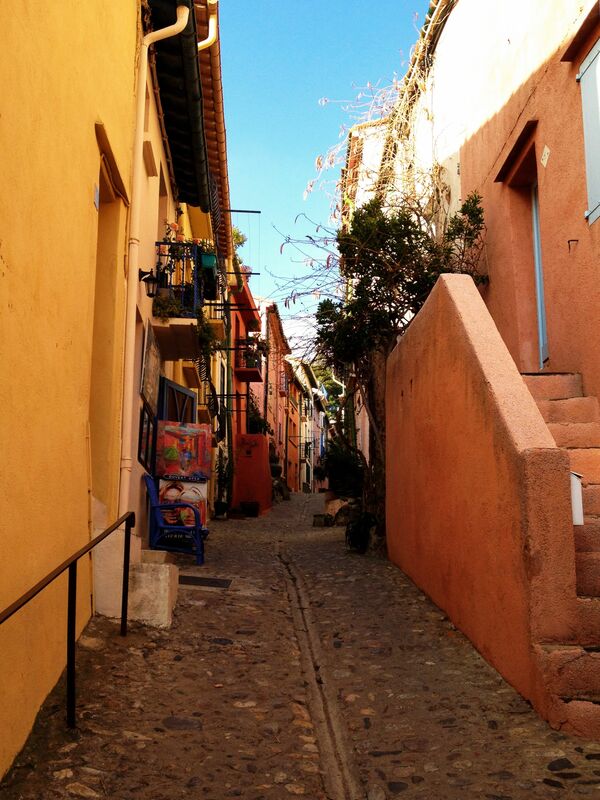 The houses of Collioure are wonderful. I love that they are painted in different colours, it is really enjoyable to walk around there. Unfortunately, the shops were closed until February too, so we couldn’t do any shopping. Well, that is not totally true. We did buy a few things in a small shop. It had a lot of healthy products. Then we visited the cemetery. It may seem a bit weird, but I really wanted to visit it because Antonio Machado is buried there. I really admire him. He is there because he had to run away from Franco at the end of the Spanish Civil War, as many other people. He died the first night after he had escaped. He is buried with his mother, who died three days later. 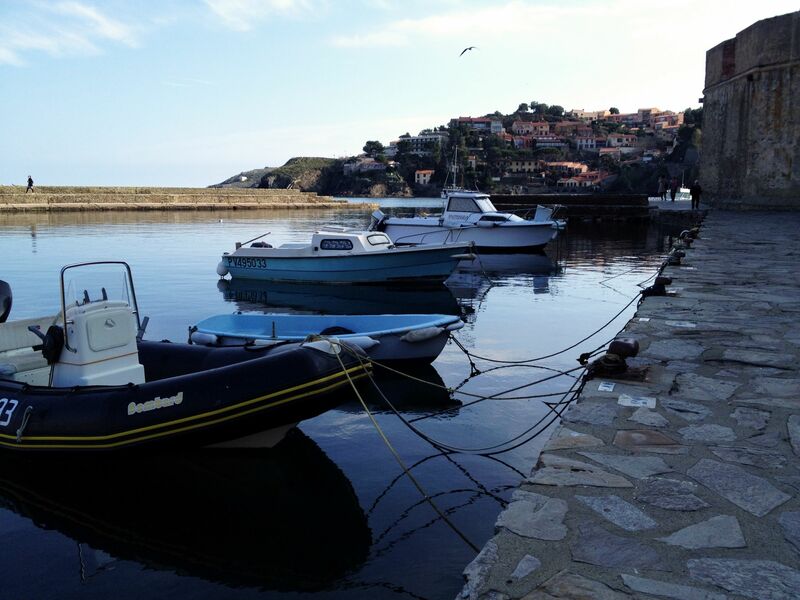 After that little visit, we went to the dock again and decided to go to the other side of the town, which is a more modern part. We finally decided to go. We were quite tired and we did not want to arrive too late at home. 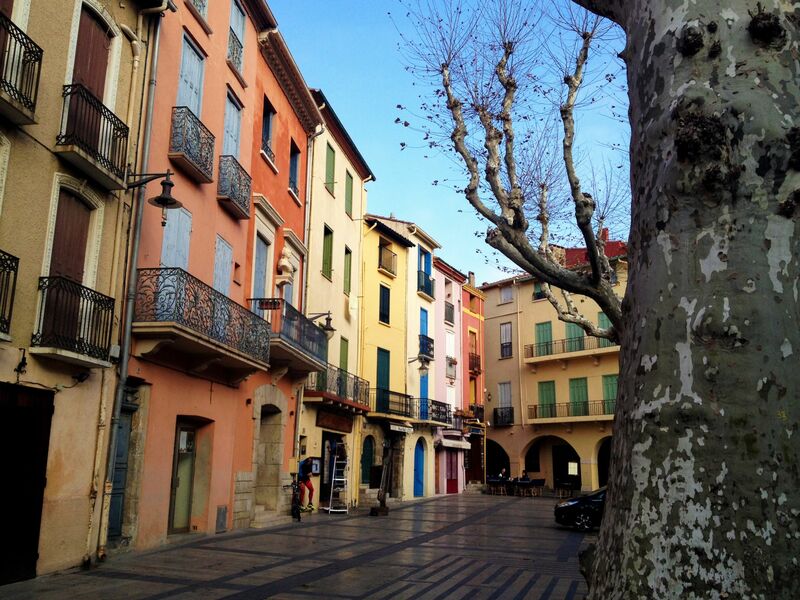 We had a great time and I totally recommend you visiting this French town, which has a lot of Catalan influence because of the people who went there after the Spanish Civil War. I hope you liked the post, and I am sorry for posting so many photos. I had so many and it has been really difficult to choose which ones I would upload! Ahhh looks incredible! And the photos are really pretty! Somehow this place looks romantic, maybe I should go there when I get my another half. But I should take my own food and drink, if coffee was that expensive I don’t want to realize how much was your lunch! 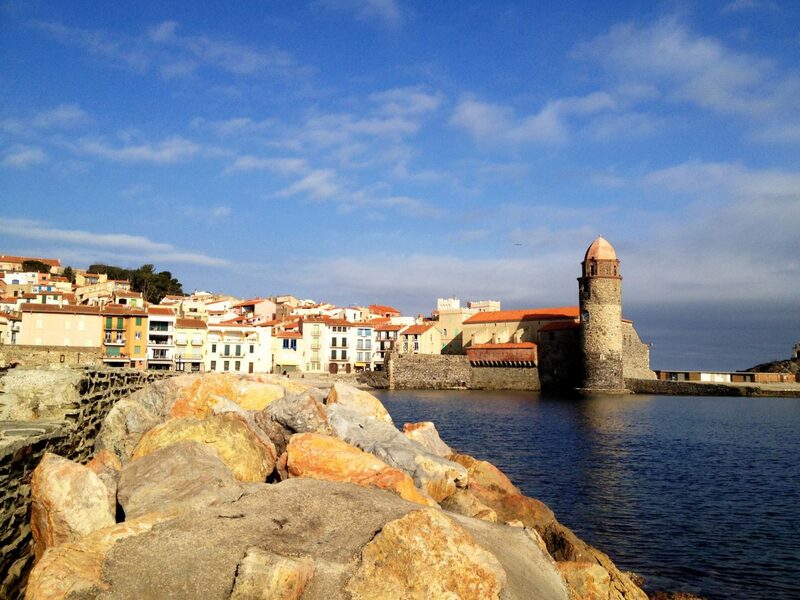 I have never been to Paris, but I can assure you Collioure is a relaxing place! It can even be a bit boring if you stay there for too long, although you can always visit some other places around there!